17 Then to Adam He said, "Because you have heeded the voice of your wife, and have eaten from the tree of which I commanded you, saying, 'You shall not eat of it': "Cursed is the ground for your sake; In toil you shall eat of it All the days of your life. Last week we introduced the idea that the general curse upon mankind as temporal in character, having contemplated the mankind to come which Adam represented, and in him had broken the original works-covenant. So, today we will finish looking at the terms of the common curse and its frustrations of man’s efforts and next, to begin our transition to the exilic life of mankind “outside” the garden-sanctuary of Eden, east of Eden. Under the “common curse” upon mankind, in a practical sense, things are pretty bad and toilsome; but, without the operation of the restraining power at work of God’s “common grace,” things would certainly be much worse than they are! what has become of him." And Aaron said to them, "Break off the golden earrings which are in the ears of your wives, your sons, and your daughters, and bring them to me." "So all the people broke off the golden earrings which were in their ears, and brought them to Aaron. And he received the gold from their hand, and he fashioned it with an engraving tool, and made a molded calf. Then they said, "This is your god, O Israel, that brought you out of the land of Egypt!" 1. Aaron gave heed to the request of the people; he heard + did evil at their request of their voices. 2. 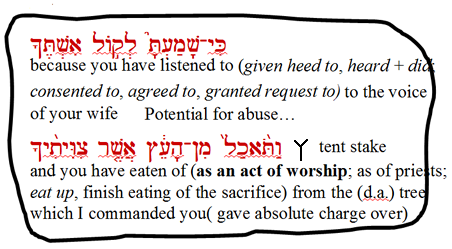 Aaron ate of the offering, in a festive worship of a false god, in the presence of the LORD. People sat down to eat and drink, and rose up to play. Aaron declared an Unholy-day –vs- a Holiday. And the LORD said to Moses, "Go, get down! For your people whom you brought out of the land of Egypt have corrupted themselves. "They have turned aside quickly out of the way which I commanded them. They have made themselves a molded calf, and worshiped it and sacrificed to it, and said, 'This is your god, O Israel, that brought you out of the land of Egypt!' "
Part of the worship was to wrongly attribute good things done by the false god, and then to demonstrate faith in the false god by looking to it for future provision and deliverance. So, as you can see, the actions taken by Adam And Eve were not simply confined to the eating of forbidden fruit. Skeptics who try to deny the truth, like to portray the actions of Adam and Eve as no more than a harmless act of taking a nourishing snack for themselves in the garden, and the actions taken by God as over-reactive.To the contrary, theirs was a highly offensive act of treason of cosmic proportion, by rendering worship to, paying homage to, and celebrating a meal to the false god( Satan), right there in the sanctuary( the holy of holies) of the true God( Yahweh-Elohim). They ate( consumed) the fruit in sacramental faith, taking action in an attitude of worship, believing that something would proceed from their sacramental act of worship, on the basis of the words of promise and assurances given them by their newly acquired god, Satan. Sacrament- an outward and visible sign of inward and spiritual divine grace. I had given an absolute charge over the tree to you. It might not make immediate sense, but God had not given Adam a commandment, He gave him a command. (A) Let’s do this backwards. By God having given Adam a command, so that the responsibility for keeping it was more direct, and the consequences for failure to keep it more severe, than if he had been given a commandment. You are in charge of the tree, you shall not eat of it. You are to restrain anyone else from eating of it. You are to uphold and protect the idea of not to eat of it. In contrast to man’s proper dominion over it, the ground would show itself hostile to man in the carrying out of this curse. and the eternal curse is correlative with redemptive grace. Later we will find curses that have their correlation in the eternal sphere of redemptive judgment, similar to the curse on the serpent-Satan, both in form and meaning. These kinds of curses are addressed to those persons doomed, and concern the ultimate issue of exclusion from the beatitude of the kingdom of God. They are an extension of the enmity instituted between the seed of the woman and the seed of the serpent in that curse. So, why didn’t God curse both Satan and man to eternal doom? But the fact is, He gave a promise in Genesis3.15 which was to be fulfilled. So, in order to make room for the kind of human history that was presupposed in the prophecy of the woman’s seed and the great warfare with the devil and his seed, final judgment would have to be postponed. God gave confirmation of His divine purpose of salvation when He promised a temporal, common curse rather than an immediate eternal judgment against the generality of mankind. On that day in the garden, God certainly pronounced judgment that manifested His displeasure, but it was not an apocalyptic appearance of the magnitude we can expect when He finally comes in His fiery wrath. The earth was not consumed that day in the garden, and man was not cast into the outer darkness. True, man fell into a terrible state of sin and temporal death; but he was not totally abandoned to the full power of sin and the devil. His (man’s) salvation at that point was to be measured by the positive benefits realized by restraints God placed upon the effects of sin and the curse. The restraints are a blessing which is temporal, not eternal in scope.They are common blessings that all men experience that are not deserved, but are to be enjoyed by the grace of the Creator by virtue of their part in the continuing order of the world, by the restraints of God’s common grace, even though all have forfeited blessings by their rebellion against Him. All creation owes thanks to God. Even the curse on the woman presupposed a continuation of the marriage institution as a divine appointment for human society; while there would be difficulties, there would still be children. Correspondingly, the curse on the ground presupposed man’s dominion over the earth; even if toil, thorns, and pests would discourage, the soil would still sent forth a provision of daily bread. Thanks to God’s common grace, chaos would be averted, and human life would find societal structuring through the continuation of the family, and the institution of government. until redemptive history runs its full course and the appointed hour of the final parousi’a (to be along side) comes. Many will be surprised on the Day of Judgment when they discover that it was just as the Word of God says; only the righteousness of Christ is able to save you.All men are sinners and no one can save himself. God is just, so He must punish sin; but He is also merciful, moreover gracious, and offers His Son as the perfect sacrifice in order to purchase a place for you in heaven, which He offers to you as the free gift of eternal life. As we continue to examine man’s earliest duties with regard to the covenant of works, although they can be categorically divided into two distinct types of classes; one in relationship with God, and the other in relationship with fellow man, all covenant stipulations are expressions of the will of the Lord. The law of the covenant is the law of man’s imzage-sonship.